Original Niven Road 2-storey shop homes, freehold. These are not renovated but have the same floor plan. Nine Niven Road pre-war terrace houses restored and modernized for rent at affordable rentals at around $8,000 for these 3-storey units in 2011. Niven Road shop home, renovated. 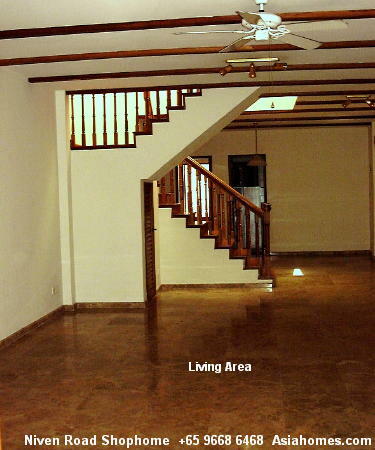 Fully air conditioned living and dining areas and all rooms except the kitchen. Alarm system installed by tenant. Contact detector - downstairs and windows, motion detector staircase. Police monitoring system costs around $400 per year some 5 years ago. retractable accordion type blind controls amount of natural daylight into the living/dining areas. Cable ready but the Tenant will have to pay for wiring into house. Separate dining area. Lady standing at entrance to kitchen. Behind her is the courtyard, around 15 sq. m.
The staircase separates the living and dining area. Daylight filters from the skylight above the staircase. The tenant will have to remove the plants. The dog can sun himself or get drenched in the rain as it is an open courtyard at the back, behind the back door. Also the master bedroom with a large modern bathroom and parquet flooring. and kitchens, but have no garden plot or maid's room. Modern kitchen, Elba oven, cooker hob with 4 gas and 1 electric rings, hood. Note the big fridge with vertical freezer on left. Stack up front loading washer and dryer in the kitchen. Stainless steel dual basin sink. 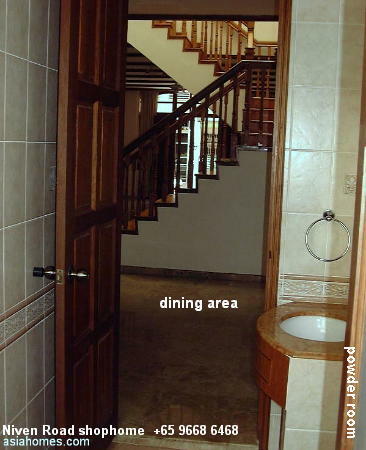 View from the powder room next to the kitchen, on ground floor looking into the dining area. Sunlight from the skylight brightens interiors. Front door and living area in the background. 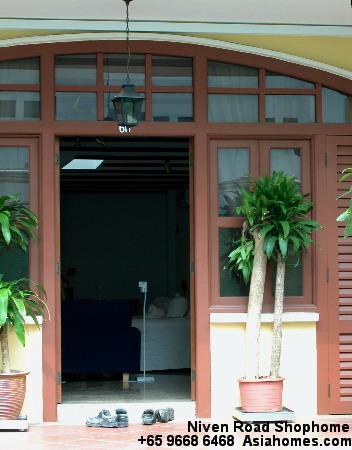 There's a courtyard for potted plants behind the powder room too. Family room (background) outside the master bedroom on level 2. 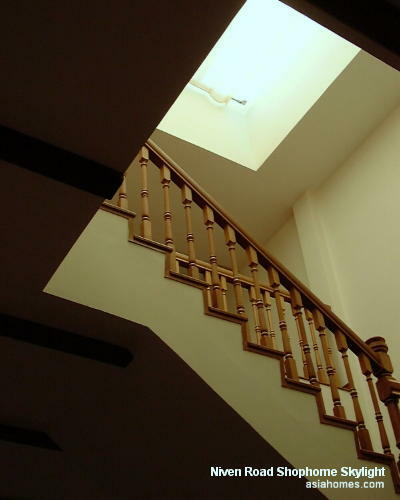 Skylight brings natural sunlight indoors. 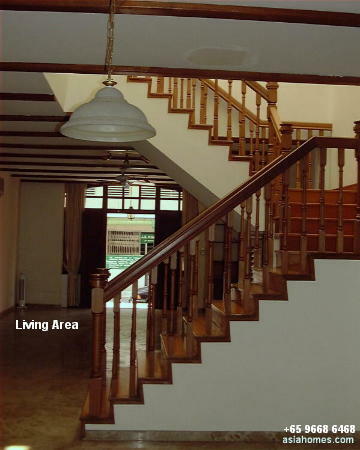 The staircase separates the living and dining areas. Living room and front door seen from the dining area. View from the marble-floor living area looking into the kitchen. Sunlight from skylight brightens first floor. 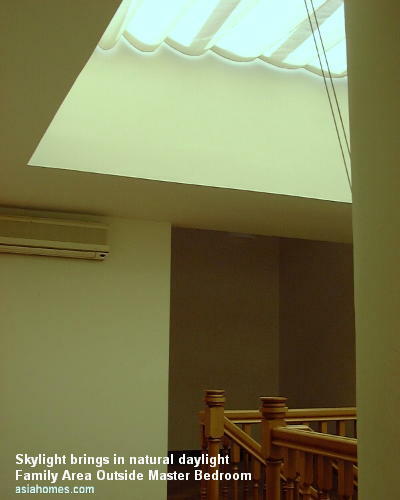 If the Tenant wants a darker area, the skylight can be closed by the moveable curtain. Modern and spacious clean master bathroom with white long bath and shower stall. Caucasian/Asian single or couple. Predominantly Caucasian tenants. Some use the shophomes as home offices in businesses such as arts education. +65 9668 6468, 6254 3326 for appointments to view. Value for money modern and BRIGHT 2-storey heritage terrace house below. The retractable skylight really brightens the shophomes which are intermediate townhouses. Suits romantic expatriate couples or sing les as this house is a unique conservation type and is within a 5-min taxi ride to downtown Orchard Road, Suntec City and Newton. No maid's room. No cable points in all rooms. However, it is possible to install cable points subject to rental negotiations. 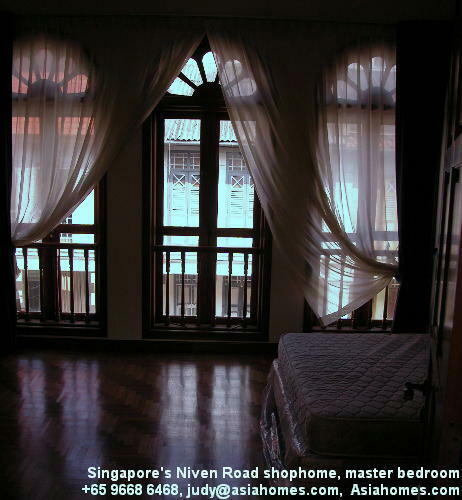 Niven Road, 3-bedroom shophouse 2551 sq ft, $7,800. Can be used as a home office but you cannot display sign-boards on your door front. 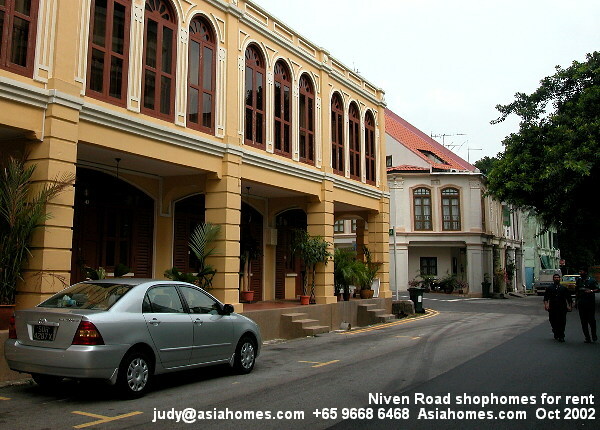 Tel: +65 9668-6468 or e-mail to judy@asiahomes.com for viewing now! Email: judy@asiahomes.com to get a list of housing or to view housing in Singapore or to make appointments to view houses or condos for rent.